"Six Disciplines That Intensify Poetry"
Tranströmer wrote this poem just before his stroke. Since then, he couldn't talk for 15 years. His mind is still alert. He communicates with his wife by writing. Could you sense the power of those last lines of his poem? "hovers just out of reach / like the family silver / at the pawnbroker's." That's some image few American writers could invoke that Tranströmer does all the time. among the olive trees in the darkness of nght. After reading the three Tranströmer poems, Bly asks the class whether they've read any of his poems. I raise my hand saying that after his reading of Tranströmer's "The Scattered Congregation" at his Colloquium (May 20), it inspired me to write "What Is The Address?" the next day. I used his last stanza about Nicodemus the sleepwalker as the epigraph of my poem. Bly asks me to read my poem and says my stanza "Ask Melencolia for / her compass to / square the circle" is too intellectual (mind weight) and suggests "Ask Melencolia to weep!" Bly doesn't care for "The Red Fountain at / Stanford Green Library / knows the secret". 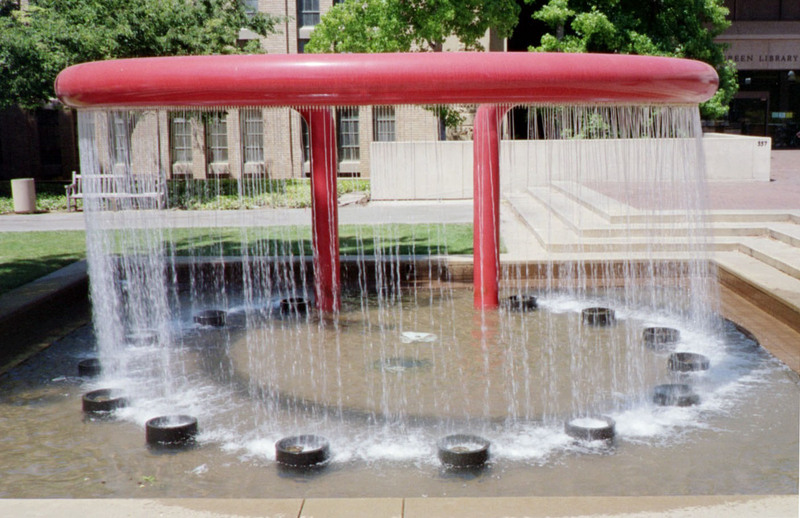 I tell him the Red Fountain portrays the symbol of π It resembles the Torii gates in Japan to a Shrine. The Library is a sacred shrine and the architect who designed this fountain knows the secret." Some students got excited when I mentioned this. Later I tell Bly that my Notes to this poem will explain my intentions more clearly. When we sit down to write, we often imagine that thoughts are coming, or feelings are arriving. But actually what are arriving are syllables, each a marriage or affair of vowel and consonant. As we write along at our desk, we watch sometimes with amazement these little sound units or particular love affairs coming along in their variety. They keep coming along, no matter what we do. But it is another thing to take part in their arriving to put out a call for sound friendships, to decide to encourage certain ones. Then we are awake by one more degree. To be awake as a writer is to take part in sound friendships and welcome them. Let's take a small poem and look at it, keeping the repeating sounds in mind. This is a poem by Robert Creeley [cited above]. The word "quietly" introduces the ai sound, and adds to it with "finally". "Quietly" also introduces an ee sound, which reappears twice as "me". But we also notice a few affairs that vowels have with n "finally", "around", "on". With the word "old", somethhing begins to shift, and the vowel oh begins to push its way in, dancing a bit with the earlier ai sound. "Thinking" and "alone" honor the consonant n; and halfway through the stanza ay begins to enjoy itself. Nature loves repetition, and we could say that the little poem of Robert Creeley has become an imperishable object of nature while pretending to be only art. The universities teach mind weight to students and not soul weight. If you write only happy poems, then it's called light verse because there's insufficient sadness in them. Need soul weight in your poems, then people don't know whether it's happy or sad. In Kafka tale about a son disliked by his father, he turned one day into a beetle. That single sentence has huge soul weight. When the father found his son in beetle form climbing up the wall, he threw an apple at him, which lodged in the son's back. This apple seems to be from the Garden of Eden story. When a detail drawn from mythology is woven into art, we feel some psychic weight. I'd like all the odor of your roses." "I have no roses; I have no flowers. All the flowers in my garden are dead." and the yellow leaves and the dried-up petals." "What have you done with the garden entrusted to you ?" Bly asks each of us to read our poems, critiquing them for "soul weight". Often he'll say there's too much "mind weight" in certain lines. Carla Baku, who has returned to college after raising four sons, has just received the Stanford Poetry Prize for undergraduates. Bly asks her to read her prize-winning poem to us "Living By Our Lights 1966". Bly says "You could feel soul weight there about other people's suffering." One student's poem: "I punctured the punctuation. / I searched for my mind and lost it. / My nightmares became daymares / and even the horses laugh at me." Bly likes his images saying "Poetry is bringing your soul out and looking at it." When Erin reads her poem with the lines "On the dance floor he hands me / a box with a painted bird", Bly says "Stay with this image!" Her next lines were "Can love exist without expectation. / Every moment is a gift. / Can you look forward to / something that never happens." Bly says "The box was leading to your soul and the mind took over! Your following lines are just abstractions. Nothing you could paint or see." Austen's poem: "A man seeking enlightenment / visits a guru and asks / "How to get this duck out of the bottle?" / Guru says "Not my duck. Not my problem" / ... When I open my closet / My shoes are so tiny. / My clothes so dumb. / I pull just one thread / and they all become undone." Bly says "Get rid of the last stanza!" One student says "Your first stanza is great! Last one should be too!" I read my poem "The Aha Moment" which was written for Bly's ramage poem homework assignment (May 6, 2008) that I didn't get a chance to read until now (see Notes). Bly says "This is the best one you've written!" He asks me to explain the details of "dangled out his eyeballs with muscles and all". I tell the class that this was a true incident from Paul Brunton's A Search in Secret India (1934). Brunton paid a rupee when the fakir dislodged his eyeball from his socket and put it back again. The sage who taught the secret of breathing the "Ah" inbreath and keeping the "Ha" outbreath came from the Himalayas to Boston to teach this secret. Before coming to Boston, the Himalayan sage taught his breathing technique to Melvin Calvin of Berkeley. As a chemist, I knew that Calvin had won the 1961 Nobel Prize for his research on the chemistry of photosynthesis. So I felt safe in learning this strange way of breathing which I abandoned after a month. Bly tells the class "Peter has met many strange fellows" then smiles at me "I'll miss you." Bly: Since this is my last class, I'm open for any questions from you folks. Q: In your younger days, did you consult with anyone after writing your poems? Bly: Yes. I would send my poems to James Wright [1927-1980] for feedback. You need to choose someone who's not vicious. Also not someone to please you. Not necessary to write in a group, but not always alone. It's hard to find people to critique your poems. Lots of fun to have your poems talked about. How hard is it to write about your parents. Q: One student quotes Flannery O'Connor [1925-1964]: "If you survive childhood, you have lots to write about." She says "Family material is a good source for my writing." Bly: I had a brother who was my father's ally. My father was an alcoholic. My mother was my ally. During World War II, I was involved in radar development in the Navy with Eisy Eisenstein. He was the first person I'd known who wrote poetry. He later taught at the University of Pennsylvania [?]. Then some thirty years later, someone connected me up with Eisy. I phoned him and agreed to meet him in a hotel in New York City. I was so eager to see him. But he never showed up. [Bly sighed as if to say "That's one disappointment."] I've been very lucky in my life. My wife Ruth loves poetry. You need to have a friend to show your poems to. My life has been a blessing. 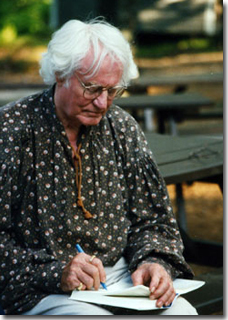 Someone once said at a party "I hate Robert Bly" and I wasn't even there. I have a daughter Mary Bly who's a professor of Shakespeare and English literature at Fordham University. She's also a Romance novel writer with a pseudonym Eloisa James which she didn't reveal until recently. When people asked her how did she manage to have two careers, she said "When I was ten, I loved reading Romance novels. My Dad said it was trash, and that I should read real literature. But he made a deal with me. For every Romance novel you read, you have to read a classic book as well. And I held up to that promise." [NY Times OP-ED] I had forgotten about that deal, but she reminded me. Well, that's my daughter, we'll see her in Elba [Napoleon's former hangout] for vacation this summer. Q: Most poets hold another job teaching. How did you support yourself having never taught in an university? Bly: I did lots of translations. They paid by the page translated. I've translated 15 books. Then I made my living giving poetry readings. I used to do readings two weeks straight, sometimes 14 nights in different cities in my younger days. I enjoyed it. I'm an extrovert. I didn't want to be tied down at an university. Some dryness comes in when you get involved in departmental politics. So I loved my freedom in what I'm doing. I have spent my whole life doing what I love. Let's honor the quail who searches so hard for food. Here I am, playing flute in a cistern like Joseph. Go on ahead and show us where the road is. Lovers, but we do play the shawm in the wind. To pieces last night could be whole this morning. Repeating something he has heard from his teacher. Robert, I hope you're not bragging in this poem. Don't drag out the comparison to Joseph. We're just talking here of feathers blown in the wind. Bly concludes the class blowing a farewell kiss to us all, saying "I'll miss you loonies." 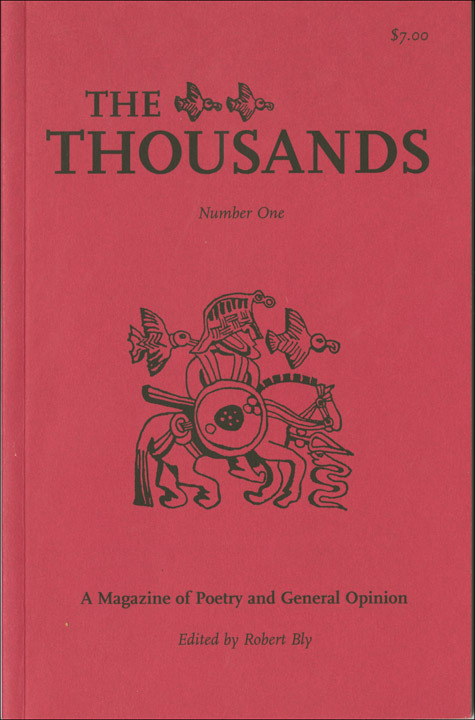 Many students go up to him for autographs of his The Thousands magazine which he gave us as parting gifts. The men in the class give Bly hugs thanking him for his guidance in their poetry and their lives. Many ask for his email address and snail mail address to keep in touch. Two Stanford Stegner Fellows [Michael McGriff & Alexandra Teague] arrive to give Bly a ride home. I walk with them to the Stanford Oval where they parked their car. Bly tells us "Stanford is such a beautiful campus. I stayed at Professor Stephen Orgel's house as he's on sabbatical this quarter. He's got all the Shakespeare books plus a lovely huge back yard." I ask Bly about his Sufi teacher in London which he mentioned during his Colloquium. Bly says "His name is Dr. Javad Nurbakhsh" spelling his name letter by letter for me. "He's 81, same as my age," Bly tells me, "but I'm just a mosquito compared to him." Bly continues "When the Ayatollah Khomeini overthrew the Shah (1979), he wanted Nurbakhsh to stay in Iran. But after their meeting, Nurbakhsh flew to Paris and then London. He needed freedom." Michael's car has arrived. Bly and I have a big hug, saying good-bye. I thank him for his generous gifts and a wonderful semester of poetry.